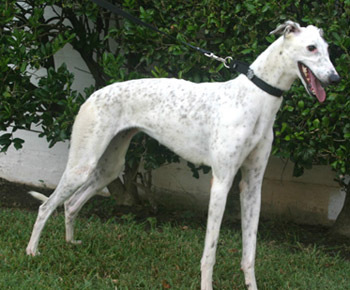 Patches is a 14-month-old beautiful white female with black ticking and a black patch over her left eye, born May 15, 2006. 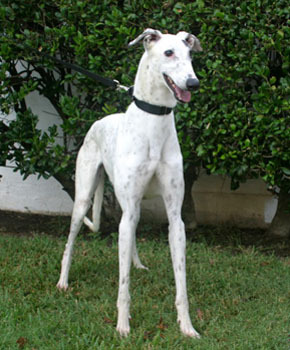 Her dam is Out of Line and her sire is Pacific Mile, an Irish greyhound. Patches is the C pup out of a seven dog litter, and was not individually registered, as she broke her leg when she was only 3 months old. Her owner, who is also a trainer who became quickly attached to her and decided to keep her as her own, said Patches was always a prissy little thing. When all the other pups were playing, Patches would be laying under a tree. If any of the other dogs came near her, she squealed! Of course, her leg is all healed up now. 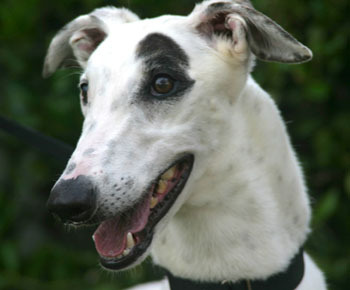 Being "in the business", the owner found it very difficult to keep her and asked GALT to take Patches to give her a better life. Patches is small dog tolerant.